At our December meeting the Forum expressed deepest sympathy to Paraic McKevitt and his family on the passing of his Dad, Brian. Brian made a valuable contribution to many committees in Carlingford over the years displaying the deep love he held for his birthplace. Following completion of our Public Realm Study, the Forum made contact with Louth County Council and we hope to re-engage with the Council in mid-January to look at the possibility of producing a ‘Design for Carlingford’. Work carried out to date will be put on display in the Station House in January. The Forum has circulated a discussion document from Carlingford Tidy Towns on new signage for the town. We await feedback from our constituent organisations and others. The Forum wishes all residents and visitors a happy, peaceful and productive New Year. We are very disappointed to learn that An Bord Pleanala has turned down the application for a car park on the main road into town from Dundalk as they say the land has now been redesignated for property development. The annual general meeting of the Carlingford Lough Heritage Trust will take place in the Heritage Centre at 7:30pm on Monday 18th February 2019. Everyone who lives in Carlingford is proud of its unique historical features and the way it has been possible to preserve so much of the medieval features. However, it doesn’t preserve itself – what we have is the result of hard work over decades, much of it by a relatively small group of people. Carlingford is a living modern community too, so there are always new issues and new problems to be solved. Our organisation needs to renew its skills, its knowledge and its membership so that it reflects the views of the whole community, because in the last analysis Carlingford Lough Heritage Trust is a community body. Please join us, and encourage people you know to do the same. Some people have found the heritage signs on buildings of historical interest in Carlingford to be difficult to read. Pamela Atkins, who among other things works hard every month to produce this newsletter, has been working on one of these signs and we think she has done a great job – the combination of blue background and clear text will draw in passersby to read more. So, we are pleased to announce that she has taken on the job of upgrading all the signs. Editors note: Be patient, it will take quite some time to paint them all! We have requested a speaker from the Office of Public Works to attend our AGM in February to update us on the archaeological and restoration work at King John’s Castle. Restoration at the entrance is well advanced and we look forward to playing our part in opening up the whole site to the public in the near future. 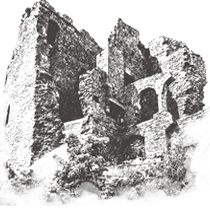 However, we are unlikely to see the castle restored to the way it looked in the early 13th century. Medieval castles were not blank masses of grey stone then, they were bright white fortresses, painstakingly whitewashed with lime mix every spring by the garrison soldiers. The whitewash was not decorative – it is much easier to see an intruder climbing your walls if they are white. No trees or bushes would have been permitted within arrow-shot (say 200 meters) of the walls, and any houses permitted near the walls had to be wooden so they could be easily fired or demolished in time of war. Create Louth has agreed to provide funding for a new series of spring concerts to take place in the Heritage Centre. A Happy New Year to all our members, neighbours and visitors. As 2018 draws to a close, the CCTA held its final Committee meeting of the year, ably Chaired by Vice-Chair James Byrne, who was standing in for our Chairman, Frank O’Brien. The meeting reviewed the past year and reflected on priorities for the coming year. The recent meetings with the Residents Committee were discussed, as was the media attention directed at recent anti-social behaviour in the town. The meeting was unanimous that the legitimate concerns of residents continues to remain the main priority, not only of the CCTA, but for the whole community in Carlingford. Some rental businesses have instituted a code of conduct for people staying in their premises and the CCTA is encouraging all rental providers and other related businesses to introduce similar codes of conduct. information of such events so that they can be more widely advertised in advance for the benefit of the whole community. 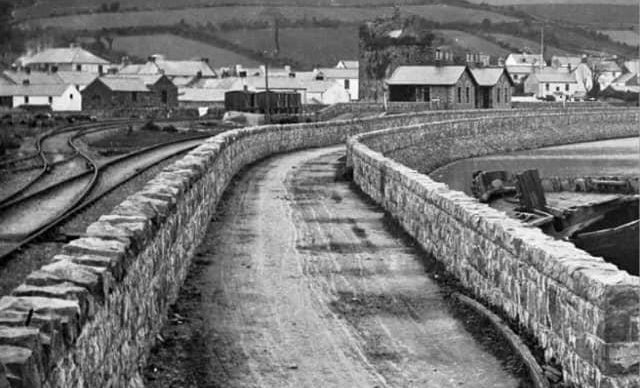 The CCTA will, through the Carlingford Community Forum seek to advance some projects, for example, the extension of the Greenway to Greenore, which it is felt will be of great benefit to the whole community. 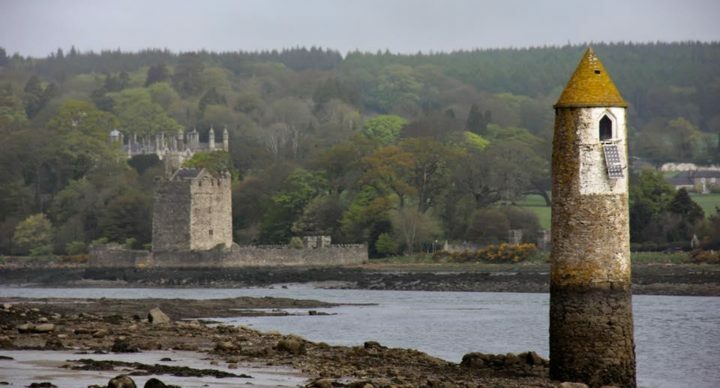 The CCTA has noted with considerable concern the recent adverse media publicity directed at Carlingford as an important tourist destination, and the potential damage that this could do to the town and the whole community as an important tourist destination. The Argus newspaper had expressed an interest in running an article on the importance of tourism to the town. This was discussed and it was concluded that the CCTA should actively engage with the paper. The resultant article, published in the Argus of 11 December interviewed many business and community interests and presented a very fair and balanced view of the town. The importance of tourism in all forms to the economic wellbeing of the whole community was highlighted in the article. The important contribution that tourism has in creating local employment, encouraging business entrepreneurship and supporting the many voluntary institutions was emphasised, while not ignoring the legitimate concerns of a minority of residents who are impacted by the activities of a very small minority of our visitors and others. While Christmas and the New Year are relatively quiet on the tourism calendar in Carlingford, it is a time for locals to enjoy the many benefits that Carlingford has to offer and the recent annual Christmas shopping day was an opportunity for people to pick up bargains in the shops. The CCTA plans to hold its AGM at the end of February and would very much like to see “new blood” on the Committee in the form of the many younger people who are engaged in running successful businesses in Carlingford. The present Committee encourages anybody who feels that they could contribute to the CCTA and the many positive aspects that tourism has to offer, to put their names forward to join the Committee of the CCTA. Apart from our usual weekly activities such as Gymnastics, Martial Arts and Fitness Classes, two other big events were held in the Foy Centre this month. The annual Choral Festival took place at the end of November. A number of choirs from around Ireland and even France attended the festival, which was a huge success. The Foy Centre was delighted that the choirs made use of our facilities during the weekend when we hosted an evening for all attendees. Jonathan and staff in The Orchard Bakery supplied the food, The Booze Brothers kept everyone entertained and the choir did plenty of dancing. Here are some more images from the 2018 choral festival in Carlingford. 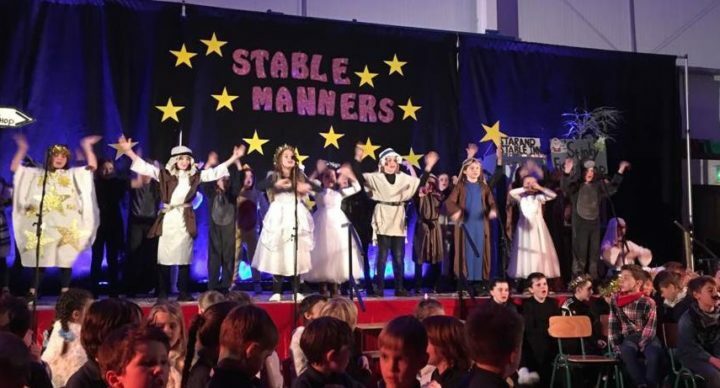 annual Christmas Play – Stable Manners. After a number of weeks of preparation and rehearsals the pupils did a tremendous job – the acting and singing was just fantastic. It was a full house and a great night out for all – with lots of raffle prizes donated by many local businesses and also some tasty mince pies and drinks. Well done to St Oliver’s staff and pupils for a great night of entertainment. The committee at The Foy Centre would like to take this opportunity to wish you all a very Merry Christmas and a Happy New Year. We thank you for your continued support during 2019.
the pitch in 2019, please get in contact with Debbie Hamilton on 083 8013777. This year CTT decided to reutilise our three large planters for Christmas Trees to bring a bit more cheer to the town. These were located on the promenade and in Tholsel Street. CTT added a bauble to the tree, which was sponsored by the traders in Tholsel Street, to spread our message for a calmer time this holiday season and we also added some red bows and lights at the corner of the tennis courts. Thank you to Louth Tidy Towns Together for the Best Shop Front Awards made to our town following the Awards ceremony held in the Crowne Plaza Hotel in November. corner with the main road is finally repaired, it will now be easier to see how the new section should be blended in. We also carried out work to reinstate the line of small posts following unnecessary vandalism last Halloween. All thirty-four posts have also since been repainted. Many people may not have noticed that the yield sign in Dundalk Street shown above had long since lost its red paint, so CTT set about restoring it in recent days. Another task completed by CTT and the TUS workers during the dark days in the run up to Christmas was the repainting of the shell sculptures on the green. Commissioned in 2002, the shell sculpture is said to be representative of the shell midden left on the shore by our ancestors. With the assistance of our TUS workers, we have also been able to install a second set of three cycle stands between the toilet block and the children’s playground. The very broken surface here will receive a coat of tarmac in due course. We have installed a litter bin halfway between the 4 Seasons Hotel and Clos Na Manach at the request of the residents and will smarten it up a bit in due course. Another recently installed addition to the children’s playground in the town is a Mr Penguin litter bin. The children are bound to love him – because he TALKS! Whenever a piece of litter is deposited, the penguin will say “Thank you”, making feeding the penguin great fun. We are able to vary the message from time to time, so that he is unlikely to become boring and we hope it will teach children to practice litter control. CTT have produced a discussion document on the subject of the Rationalisation of Finger Signage within the town which we would like to be widely circulated in order to gather opinions on ways to improve it. This will be actioned through the Forum to enable a policy agreement to be made on the way forward. In common with the other community organisations featured in this newsletter, Carlingford Tidy Towns wishes to announce that its AGM is also being held shortly. We duly invite all resident’s groups, community groups and businesses to our AGM in the Heritage Centre at 8pm on Friday 1st February 2019 when wine and nibbles will be served. We have accomplished a great many things over the past year and our planned activity list for next year shows no reduction in our attempt to improve facilities for all. We are certain you will find our plans of interest and we would welcome both your views and participation in the coming year. Carlingford has become known for its outdoor events held over the Christmas period and this year shows more people than ever are attending. First there was the 300 metre swim from pier to pier held at midday on Christmas Eve – with a hang glider watching the event from the slopes of Slieve Foy. Then there was the St Stephen’s Day walk along the mountain side to the Omeath Picnic spot and back. And finally, a little Christmas cheer can also be found at Maggies Fireplace. If you are preparing a will you should contact your solicitor for advice. If you already have a will you can make an amendment (a codicil) to include a community group.